Add even more prestige to your gift by engraving the top of the crate's lid with your own personal message. This timeless gift is destined to leave a lasting impression. One bottle each of Dom Perignon Brut Champagne and Opus One, along with two more bottles of fine wine, specifically chosen by our Sommelier. Due to availability and increased demand, the two companion fine wines are subject to change. Read more about the contents of this gift. 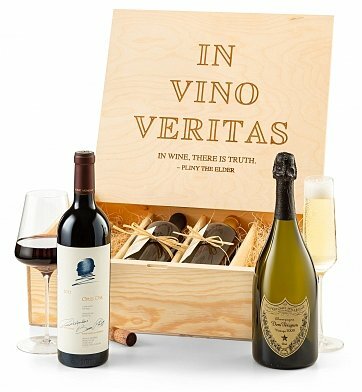 This fine wine gift is presented in our enduring wooden wine crate emblazoned with the quote of your choice on the inside of the lid, as well as complimentary engraving on the top. A complimentary card with your personal message or greeting is included with your gift. Free Engraving Your chosen personal message can be engraved on the outside top of the wine crate lid. Up to five lines of your personalized engraving can be added. Complete the personalization instructions at checkout. Measures 16.5" x 15" x 5". if ordered by 5:00 pm EDT Saturday April 20th. Sommelier's Four Bottle Fine Wine Selection is a hand delivered gift. These gifts are delivered by one of our local design centers located throughout the United States and Canada. Same day delivery is available for most gifts when ordered before the cutoff time. The cutoff time for Sommelier's Four Bottle Fine Wine Selection is 2 PM in the recipient's time zone. Opus One Cabernet SauvignonA lauded Bordeaux-style blend from Napa Valley that expresses the best of the Big Five grapes. A collaboration between Baron de Rothschild of France and Napa Valley's own Robert Mondavi, the Opus One is a California grown Bordeaux-style blend prized for its smooth decadence. Look for ripe berry flavors backed by tobacco, licorice, and smoke, then settle in for a long luxurious finish. Four bottles of fine wine including Opus One and Dom Perignon Champagne. GiftTree signature wooden wine crate with the engraving of your choice. Includes complimentary card bearing your personal gift message.